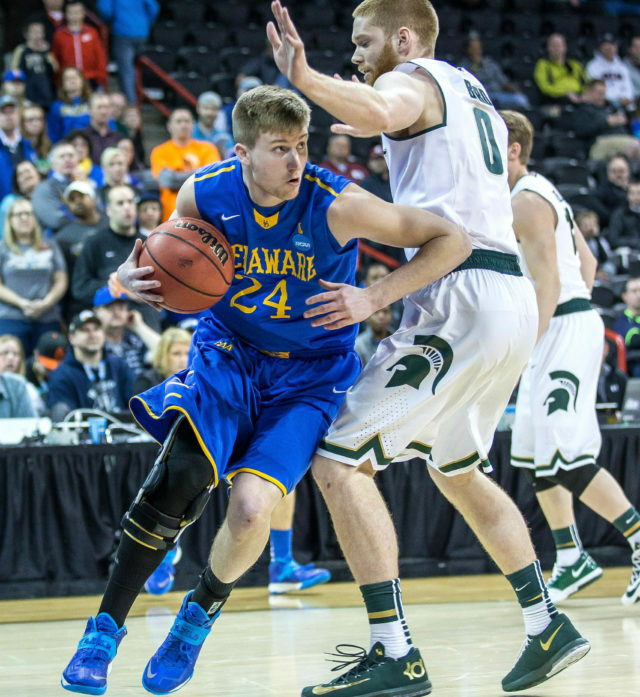 Sean Locke as a Delaware Blue Hen vs. Michigan State in the NCAA tournament. When you talk to people who knew Sean Locke, a few things come up. He was, without question, a fantastic basketball player. There wasn’t anything he wouldn’t do for his family and friends. And none of them knew that Locke was suffering from depression, an illness that would ultimately cost him his life at age 23. Locke, a graduate of Mount Aviat Academy and St. Mark’s High School, stunned those around him when he took his own life last July. His death has left a void in their lives, but they are determined to help others hurting in silence. 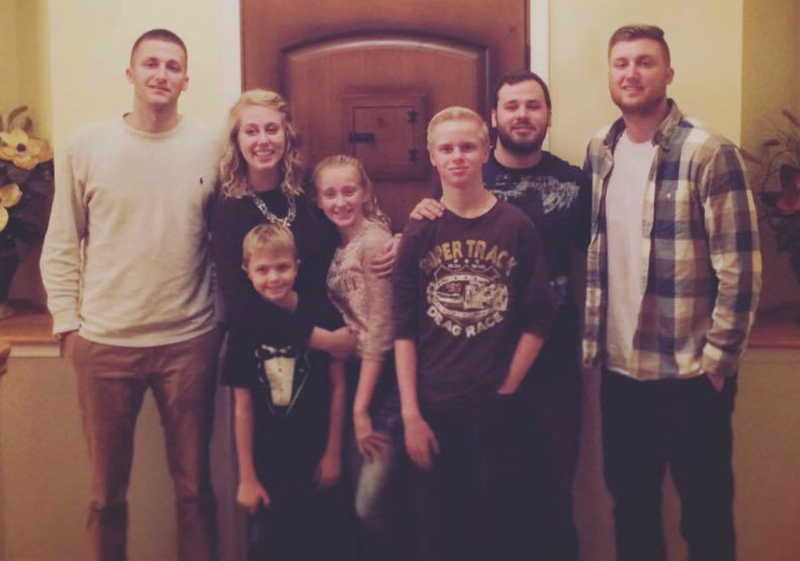 Sean Locke, right, pictured here with his six siblings. They have created UnLocke the Light, a foundation that aims to provide resources for those struggling with depression, self-injury and suicide. The foundation is sponsoring the SL24 Memorial Basketball Classic at the 76ers Fieldhouse in Wilmington on Feb. 8, four games that will benefit the foundation. They are the first events at the new facility that do not involve the Delaware Blue Coats, the Philadelphia 76ers’ affiliate in the G League. Chris Locke, Sean’s father, had no idea his son was suffering. Sean had a promising career at the Buccini-Pollin Group and was getting ready to move to Philadelphia. Nothing seemed amiss, according to his father. “I talked to him on Monday night, and he passed away on Wednesday afternoon,” he said. One of the driving forces behind UnLocke the Light is Trevor Cooney, a longtime friend who also enjoyed a lot of success on the basketball court. The two met when they were both in grade school, and it continued when Cooney went to Sanford School and Locke to St. Mark’s. Both played college basketball – Cooney at Syracuse and Locke at Delaware – and would play golf, go to the beach and attend parties together. 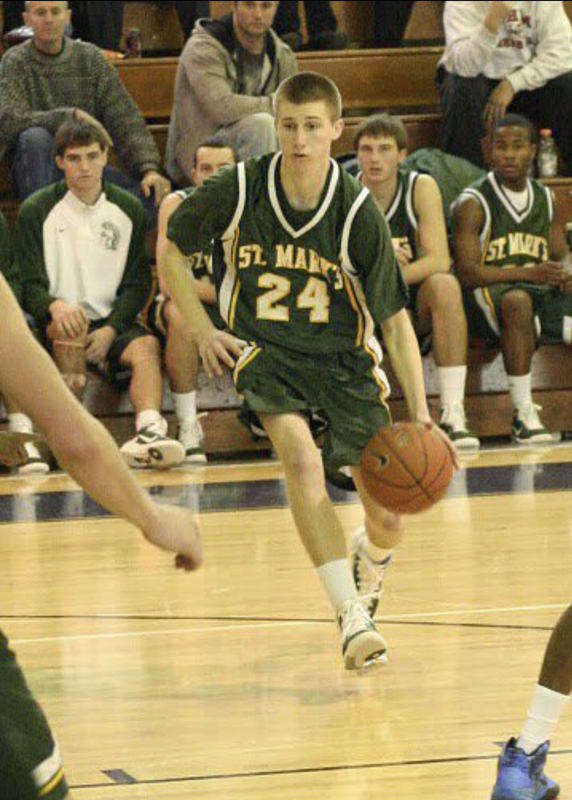 Sean Locke in his days at St. Mark’s. Cooney played professional basketball overseas after graduating from Syracuse, and when he returned to Delaware Locke helped him get an interview with Buccini-Pollin. By the time Cooney was hired by BPG Sports as director of courts at the new fieldhouse, his friend had died. “During the viewing, Sean’s family talked about awareness. I kept hearing that, and it just kind of stuck with me. When a friend helps you out, you want to help them out. I wanted to help Sean for helping me, but I never got the chance to do that,” Cooney said. Chris Locke said they started UnLocke the Light to educate high school and college students and to help end the stigma that accompanies mental illness. “He never told anybody about it. We’re going to focus on athletes, and the last thing is to build a place called Sean’s House,” he said. Sean Locke first entered the public eye as a freshman at St. Mark’s in 2008-09. He began the season with the junior varsity, but he practiced with the varsity, said Spartans coach Nick Sanna, who was in his first season at the helm. Around Christmas, Locke was promoted and impressed in his first game, at Wilmington Friends. To this day, Locke is the only freshman to start for Sanna. The coach remembers senior night at St. Mark’s in 2012, when Locke – who was playing great basketball – partially tore his anterior cruciate ligament against Middletown. He played the rest of the season on fumes. What Sanna remembers more about Locke is the effect he had on other people, and not only athletes. He was involved in service projects and student government at St. Mark’s. Cooney thought about their shared love of basketball, and his new job put him in position to help out. He approached Chris about starting the foundation and putting on an event to raise awareness of mental illness. They looked at the high school schedule, first checking St. Mark’s. They noticed that the Spartans were playing Salesianum on Feb. 8. It seemed like the perfect opponent for the first SL24 Memorial Basketball Classic. “It’s two schools that have gone head-to-head in just about every sport. That game always means a lot to them no matter what sport it is,” Cooney said. Chris Locke said Sean loved the rivalry, and beating Salesianum meant something extra to him. Sean’s brother Kevin was a member of the Sals’ basketball team, but before the two could go head-to-head on the court, Kevin came down with an illness. The Feb. 8 game is technically a Sallies home game, but they had no problem moving to the fieldhouse. The St. Mark’s girls team will play Ursuline, and junior varsity games were added for both the boys and girls. Sanna is excited about the chance to play in the inaugural SL24 Memorial and noted that one of his players is junior Aedan Locke, another brother. The coach also appreciates Salesianum agreeing to move the game. “They’re always really receptive to stuff like this. They have a tremendous program and a tremendous school,” he said. “I love the message that’s going to get out there. Chris Locke and the Locke family have been tremendous in getting this going,” he added. Chris Locke said several local elected officials are expected to attend, including Gov. John Carney, a St. Mark’s graduate. There will be merchandise sales, a silent auction, raffles and other fundraisers. “We’re trying to take the tragedy of 2018 and do something positive in 2019,” Locke said. “I don’t want to see any parents go through what we went through. I had no idea how prevalent depression is in our youth. The business community has responded. Cooney said sponsorship for the classic is into the six figures. He is grateful, although not too surprised. But, as all have pointed out, depression is not always easy to spot. Most people have been affected by mental illness, and Sean’s House could provide the support necessary to prevent another family from having to experience such a tragic loss.